And do not be conformed to this world, but be transformed by the renewing of your mind… (Rom 12:2). We are to be transformed so that we will know the will of God for our lives, what our destiny is, ordained by God in eternity past, when we were a spiritual being. We are all unique; we all have an individual destiny, but for each one of us it is to bring the rule of God into our own particular sphere of influence. God called Adam to subdue the earth and rule over it, to bring heaven to earth, so that earth would be a reflection of heaven. If we don’t know what it is like in heaven, we cannot reflect it here on earth. The Promised Land is an illustration of our inheritance, both physical and spiritual. The “-ites” nations occupied Israel’s inheritance and were not about to simply walk out and vacate the land so that God’s people could walk in. Israel was supposed to take possession of the land – and there were things that needed dispossessing. If we want to inhabit our inheritance and become completely whole, spirit, soul and body, we have to deal with those “-ites” that represent things in our lives. They are hindering and blocking God’s kingdom and the fullness of His provision for us, so we cannot afford to leave behind any little stronghold or pocket of resistance of the enemy, any familiar spirit, anything that can rob us of our inheritance. When the children of Israel were challenged to enter the land, all kinds of thoughts and fears suddenly surfaced in them. They saw themselves as grasshoppers compared to the giants living there. Only Caleb and Joshua protested, “The Lord is with us; do not fear them”. We too may have giants in our lives: things which intimidate us, frighten us and stop us fulfilling the purpose of God. Thoughts may come into our mind to oppose us, stop us, and cause us to fear. But like Caleb and Joshua, we will come into our inheritance if we believe what God says and act on it in faith. But indeed, as I live, all the earth will be filled with the glory of the Lord (Num 14:21). God will fulfil that promise. Not just a small piece of land in the Middle East, but the whole earth. If the nation of Israel had done what the Lord said, they would have taken the whole world (which was actually Abraham’s inheritance). They did not, but we will. For the anxious longing of the creation waits eagerly for the revealing of the sons of God (Rom 8:19). Everything in the physical and spiritual sphere, the heavens and earth, is waiting for the true sons, joint heirs with Christ, to enter into in the fullness of our inheritance. Lift up your heads, O gates, And be lifted up, O ancient doors, that the King of glory may come in! (Psa 24:7). Heads are symbols of authority, and gates are access points. Each one of us has authority. We are called to be a head and not a tail. We are called to rule in our individual spheres. If we are lifted up to a place of authority we become gates for the King of glory to come into this world through our lives. As we are lifted up, the ancient (or everlasting) doors are also lifted up, so that the glory comes from heaven to earth. In every revival (outpouring) an everlasting door is open. Everlasting doors are access points for heaven to invade earth, around our lives, in our spheres of influence. Scripture also calls them the ‘windows of heaven‘. We have to access heaven in order to deal with the nations, the dragons and the giants. It is no good trying to have spirit, soul and body to access the world, unless we have the spiritual authority operating in heaven. The enemy has taken possession of our spiritual inheritance. We have stayed on this side of the “river Jordan”, afraid to go into heaven. Religion has told us we could not go there, that if we did, we would die. But our thrones are there, and we should be ruling on them: we should be exercising the authority God has given us. If we do not rule, someone or something else will rule in our place. 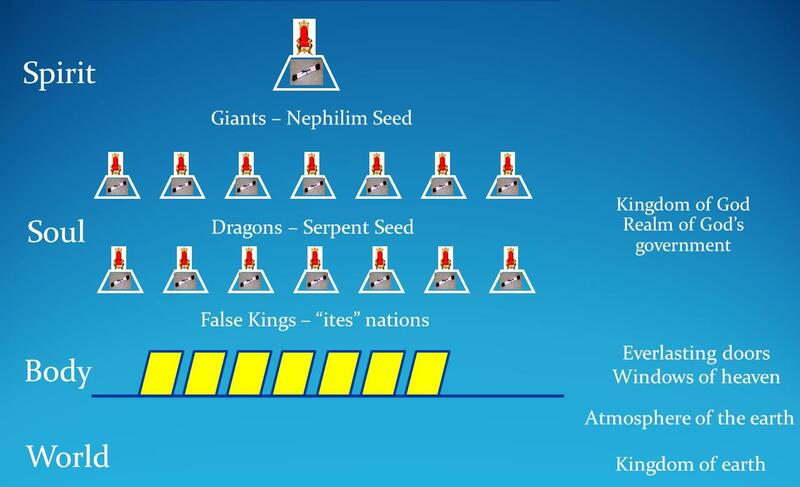 Our blood line and seed line iniquity can enable the enemy to occupy our mountain thrones in the ‘kingdom of God’ heavenly realm and block the everlasting doors. When Noah awoke from his wine, he knew what his youngest son had done to him. So he said, “Cursed be Canaan… (Gen 9:24-25). Ham was the father of Canaan, and Ham’s sexual sin and perversion can be seen in the increasing depravity of the eleven “-ites” nations and in Sodom and Gomorrah. The Canaanite gods and goddesses engaged in all kinds of sexual acts and their worshippers engaged in ritual prostitution, infant sacrifice and other deviant behaviour. They were totally impure genetically and needed to be wiped out. Joshua was instructed to destroy them to stop the iniquity continuing. Each of us came from one or more of Noah’s three sons. If we ask, God will give revelation of what is in our generational line which needs to be dealt with. Even if something lies dormant and is not operating, it is just waiting to come to life. If we don’t deal with it now, it can affect us in the future. Then in the fourth generation they will return here, for the iniquity of the Amorite is not yet complete (Gen 15:16). Abraham was promised all blessings in that territory, but only after the fourth generation had been completed. The fourth generation came, but turned back. Joshua and Caleb were its only representatives who remained in covenant relationship. They became giant-killers, king-killers and stronghold-takers. That is our inheritance. Patterns of repetitive sin – rob us. Negative influences – block our inheritance. Receive a mandate of divorce separating us from the effect of those things. Then the everlasting doors can be opened in our lives, and we will be able to receive the fulness of our spiritual and physical inheritance. When we are transformed and changed, nothing in our life can rob us of the fulfilment of God’s promises for us. Then the earth will indeed be filled with the glory of God. 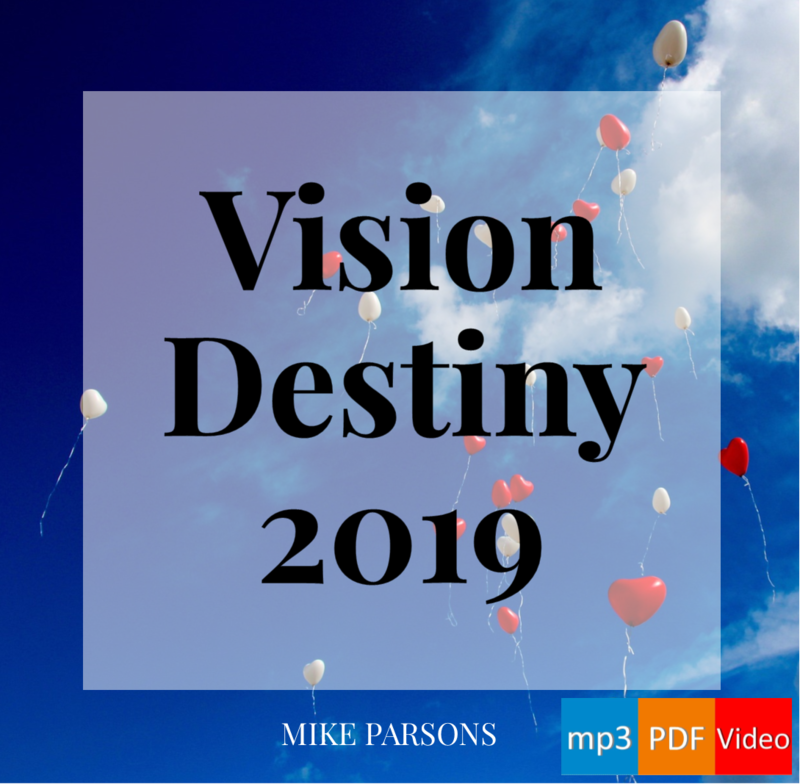 Transformation 20-part audio series with slides (this post is based on extracts from Mike’s notes for session 13). Join Mike, Nancy, Justin and Lindy in Barnstaple in June 2019. Get more details here! If we were with God as spirit beings before time began and agreed with the destiny God ordained for us. Did people agree that they would be “taken to the dark side” or did they decide at some point to go against destiny they had agreed with God? Wow! So much to take in ,absorb and then walk out … I feel that there are many answers here to questions that had not even been fully formulated … so excited to see the enemy so clearly exposed along with the proper tools and weapons to fully defeat him. On to victory and freedom. Praise His Holy Name! I AM MOST BLESSED BY YOUR BLOGS, INSIGHTS AND LIFE CHANGING REVELATIONS. THIS BLOG FITS RIGHT INTO MY PURSUIT TO OPEN WIDE THE FIRST LOVE GATEWAY. UNLESS I ADDRESS THOSE ISSUES AND SINS ASSOCIATED WITH THE KINGS IT WILL TAKE MORE TIME TO EXPERIENCE THE FLOOD OF THE RIVER OF LIFE INTO MY SPIRIT. Hi, I purchased the transformation series along with a few other misc teachings, but I cannot figure out how to download them. Can you tell me how to find my downloads? I’m really sorry you have experienced a problem. Please can you check the email address you use for PayPal (oinkflyer…), because that is where the email with the links will have been sent. If you are still not able to find them, please email me at jeremy@freedomarc.org and I will send the links manually. Please excuse me if there is some delay, as it is New Year’s Eve and a busy evening!